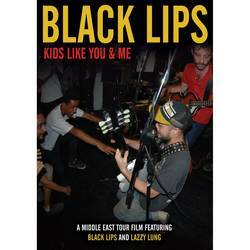 At one point during Kids Like You & Me, the documentary chronicling Atlanta "flower-punks" the Black Lips' 2012 tour through the Middle East, drummer Joe Bradley remarks that it would be easy for the band to go out and book a tour in North America or even Europe really since the band already has a developed audience there. However, for the group to book a tour that would take them though Cyrus, Egypt, Lebanon among other stops would be much more of a challenge for them as artists. By all accounts, neither indie rock nor its cousin garage rock are very prevalent in the Middle East. For the Black Lips, a band whose live set was long characterized by exposed dicks, fireworks and general excess, to tour through the area just seems downright brazen. In the documentary, all four members of the band make reference to an ill-fated tour through India a few years prior in which the band says they "got in trouble" but avow that they "learned their lesson." And that's the other thing. Bassist Jared Swilley, guitarists Cole Alexander and Ian Saint Pe and drummer Joe Bradley are 100% sincere in their desire to explore this part of the world that, when it makes the news, is for war and civil unrest. Throughout the film, the band talks about wanting to meet new people and have new experiences with this culture that they know very little about and in turn no very little about them as well. And it's not a put-on, either. At various points in the film, Cole is seen exploring the area and talking with the locals while buying rare records and eating the local specialties. After shows, he poses for pictures with those that made it out for it. The film opens with various news reports coverage of the unrest in Egypt. As talking heads from the BBC, CNN, etc flash across the screen, text at the bottom informs the viewer that a week after this batch of reports came screaming in, the band headed out on their tour of the Middle East. Aside from some cancellations that are discussed but never actually seen, the tour seems to have been a resounding success. At each of the six stops the Black Lips make, they play to attentive, enthusiastic crowds each time. Anyone seeking a documentary that shows a tour off its rails will have to look elsewhere. Despite their past antics, the Black Lips are a professional rock and roll band. They carry with them a certain Southern charm that makes them seem just odd enough to embark on a journey like this, but one that also allows them to knock it out of the park night after night. In most cases, the people are just damned stoked that there's a show happening in the first place and the band is more than willing to indulge them in a night of rock and roll and good vibes. Throughout their trek, the band does the usual media meet-and-greet explaining their intentions, and expressing time after time that they want to see all that there is to be seen. Early on while reading an article from Creative Loafing, Ian and Jared express disappointment in their local alt-weekly's seemingly dismissive write-up about their tour. "We wouldn't travel halfway across the world just for the sake of being ironic," Swilley says. Throughout the course of Kids Like You and Me, this is evident. The band wanted to go to a part of the world that no one else was going to and they wanted to meet the people there and learn more about them while at the same time share where they are coming from. That's what happens here for 75 minutes and it warms the heart. Posted July 28, 2014, 7:39 p.m.
Posted March 3, 2015, 5:58 p.m.
Posted July 17, 2014, 8:40 a.m.
Posted Feb. 25, 2014, 7:52 a.m.